Six Flags America is a great destination for a day of family fun with more than 100 exciting rides, games, shows and attractions including Hurricane Harbor water park. While the Superman Roller Coaster (shown above) has been a long time favorite at the park, there are now 10 roller coasters at Six Flags. SUPERMAN: Ride of Steel is a hypercoaster so intense they had to come up with a whole new category for it. The oversized roller coaster is pumped at a height of 205 feet with a mind-blowing 200-foot drop. In 2016, the park added an all-new, ground-breaking experience incorporating the most innovative and cutting-edge technology—the world’s first Superman-themed Virtual Reality Roller Coaster. A new coaster is headed to the park in 2019: the Firebird, where riders will twist and drop while seated in innovative floorless trains. 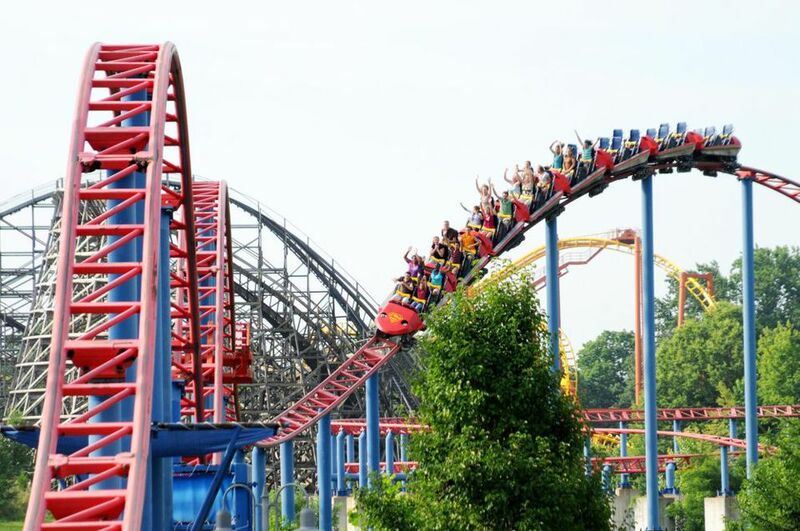 Enjoy the following photos and get a glimpse of the top attractions at the Maryland amusement park. At Six Flag's water park, Hurricane Harbor, Splashwater Falls, a giant interactive water playground features dozens of slides, nets, sprays, geysers and thrills. A super-sized tipping bucket atop the huge attraction dumps water on guests throughout the day. Unique to Six Flags America, the attraction includes a Chesapeake Bay inspired theme including blue crabs, the Baltimore Lighthouse, a blue heron and the Maryland flag. Splashwater Falls complements the variety of experiences for the whole family including thrilling attractions like Tornado, a six-story funnel of fun; Bonzai Pipelines, the high altitude drop slide, Castaway Creek lazy river and the largest wave pool in the region, Hurricane Bay. Batwing is Maryland's first flying roller coaster and offers a thrill for all, travelling at speeds higher than 50 miles per hour. You actually start this pure flight experience lying on your back. As you ride up the stunning 115-foot lift hill, enjoy the view of the pretty sky, because in just a moment you’ll be flying through it like a wild bat. Six Flags America features dozens of rides to provide fun for all ages and senses of adventure. Riders enjoy the whimsically fun Flying Carousel at Six Flags America in Maryland. A circle of swing chairs swirl around the ornately carved centerpiece, rising up, flying through the air, on this seated, swinging, twisting and tilting carousel. Jokers Jinx Roller Coaster is a thrilling ride that takes you upside down four times at a speed of more than 60 mph. THE JOKER’s Jinx has a cutting-edge linear induction motor launch system that will get you from 0 to 60 miles per hour in just over three seconds. Younger children will enjoy a hug and a picture with some of their favorite Looney Tunes characters such as Bugs Bunny, Daffy Duck, Sylvester, Tweety, and more. To learn more about the theme parks in the area, see Amusement Parks Near Washington DC (Which One is Best)?